This survey was created by Jamie from The Perpetual Page-Turner. Author you've read the most books from. Hmmm....probably Enid Blyton! I think I read nearly ALL her books when i was younger, and that's a lot! Famous Five, Secret Seven, Malory Towers, St Clares, i read zem all! Divergent by Veronica Roth. Yes. I said it. I didn't actually think i would enjoy it at first. It was just at the beginning of my blogging ''career'' when i heard about it and i hadn't read many dystopians before that - and the cover i'd seen on it at the library wasn't appealing (yes, i sometimes judge books by their covers..sshhh..) so i was hesitant to pick it up, but i gave in to the hype and did..and LOVED IT. obviously. Between The Lines By Jodi Picoult and Samantha Van Leer. The Illustrations guys, the illustrations! *swoons*. Last Chance Angel by Alex Gutteridge and Roller Girls: Falling Hard by Megan Sparks. I loved them by the way. And i really want to start Roller Derby now..what do you think my name should be?.. *cough* Erotica, need i say why?..Vampire books i will very rarely read as well. I do't know...i read pretty long books. Probably one of the Harry Potter books although once i've read The Bone Season by Samantha Shannon i think that'll blow all the other books out of the water! One. But i also have piles of books under my bed, in my cupboard and i have a few shelves under my mirror. I NEED MORE BOOK SHELVES. The Goose Girl by Shannon Hale, Between Shades of Gray by Ruta Sepetys and Divergent by Veronica Roth. The Infernal Devices Trilogy by Cassandra Clare, The Hunger Games Trilogy by Suzanne Collins and The Divergent Trilogy by Veronica Roth: i know the last one isn't out yet BUT IT WILL BE AWESOME. Same goes to The Lunar Chronicles by Marissa Meyer and the Geek Girl series by Holly Smale. FOOD. Oh a book? My bad. The Elites by Natasha Ngan. ALLEGIANT AND NOT A DROP TO DRINK AND GEEK GIRL: MODEL MISFITS AND RESIST AND CRESS AND THE NEXT BOOK RUTA SEPETYS WRITES. ok? Not reviewing a book straight after i've read it. And bugging people who are reading a book i've read and loved. Me: What page are you on? Me: What page are you on now? Butter by Erin Jade Lange, The Diviners by Libba Bray, Partials by Dan Wells and Etiquette & Espionage by Gail Carriger. Rose Under Fire by Elizabeth Wein. 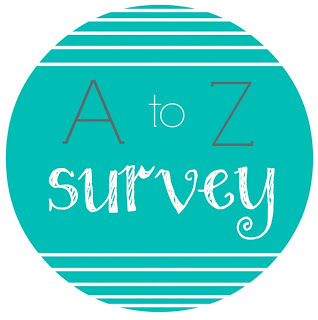 Have you done the A to Z Book Survey? If so, leave a link in the comments so i can come visit! How many books do you read at a time?! I only ever usually read one, at the most two. You've got hundreds! WHAAAAAAAAAAAAAAAAAAAAAAAAAAAAAAAAAAAAAAAAAAAAAAAAAAAAAAAAAAAAAAAAAAAAT SUNNY! I mean, it's your opinion and stuff but NOOOOOOOO. read it anyway?!! ALLEGIANT. OMG. I AM SO EXCITED FOR ALLEGIANT I CANNOT EVEN. Unrelated: The longest book I ever tried to read was War & Peace. Don't do that. There's so much hype but I was convinced I could do it and I was all, "PFFFFT I WILL MAKE EASY WORK OF THIS NOVEL, THE ONE THAT IS BIGGER THAT MY BIGGEST DICTIONARY" and now it's been two years and I'm 40 pages in and when will it enddddd. NOR CAN I AND I AM GETTING A COPY AND OMG OMG AAAAAHAHHHH..
just chuck it under your bed and TRY AND FORGET! But seriously. I almost threw my laptop out the window at that HP thing. DON'T SCARE ME LIKE THAT HAWWA. DON'T DO THAT THEN YOU WON'T BE ABLE TO TALK TO ME....but fiinne...i'll try not to. OK OK I WON'T BUT WHEN SOMEONE SAYS THEY HATE HARRY POTTER BAD THINGS HAPPEN AND THAT IS A FACT. OH NOOOO!!!!! UNSLUMP YOURSELF! I would recommend something AWESOME to get you going again like, hey, I don't know, CODE NAME VERITY.